International Chamber Soloists is the unique group of extraordinary young string players from all over the world. There are musicians from Russia, Bulgaria, Latvia, Korea, Taiwan,New Zealand, Australia,Venezuela, Brazil and US. What brings them together is love and dedication to Music. It all started in United States, when prominent violinist Dmitri Berlinsky moved from Russia to New York as a winner of Young Concert Artists and other most important International Competitions such as Paganini in Genova, Montreal in Canada, Tchaikovsky in Moscow, and Queen Elizabeth in Brussels. Since then he has been performing as a soloists with major orchestras in US, Europe, Latin America, Asia and Australia. Throughout all those years it was his dream to find an environment to establish a chamber orchestra where his colleague-friends could find an inspiration and joy of playing together and with their support he would be able to achieve his highest artistic vision as a violin soloist. Finally, it happened when a few years ago Dmitri Berlinsky was invited to join the faculty of Michigan State University and was encouraged to invite exceptional talents to build rapidly growing reputation of this important institution as a major music facility.There came musicians from different countries and started building this ensemble. In the recent years members of New York Philharmonic, Cincinnati , Detroit Symphony have been regularly joining ICS on tours and festivals. As an active chamber musician, Mr.Berlinsky’s intention was to emphasize the artistic importance of each member of the group and find the way to incorporate it in the chamber orchestra settings. His goal was to be able to find the way to nurture musical chemistry, which will allow effortless music making and will bring freshness to each performance. After their first concert it was evident that International Chamber Soloists will be a great success, since this group was able to perform with the freedom of expression and communicate with the audience. Berlinsky was able to play most challenging violin concertos directly communicating with the group without the conductor, creating a magic chamber music atmosphere. Immediately, there came invitations for future engagements at the concert series and festivals in US, Europe and South America. Last summer ICS opened the 15th International Music Festival Credomatic in San Jose at the National Theater where they received a critical acclaim.Recently ICS performed for Governor Gala in Campeche, Mexico. That concert was broadcast nationally. Their performance at the Fontana Chamber Arts Festival in July 2008 brought them a rave review.Later that fall they had a great success at the San Francisco Conservatory, which was part of Michigan State University Gala. Also they performed at the Collage concert at the Wharton Center in Lansing. 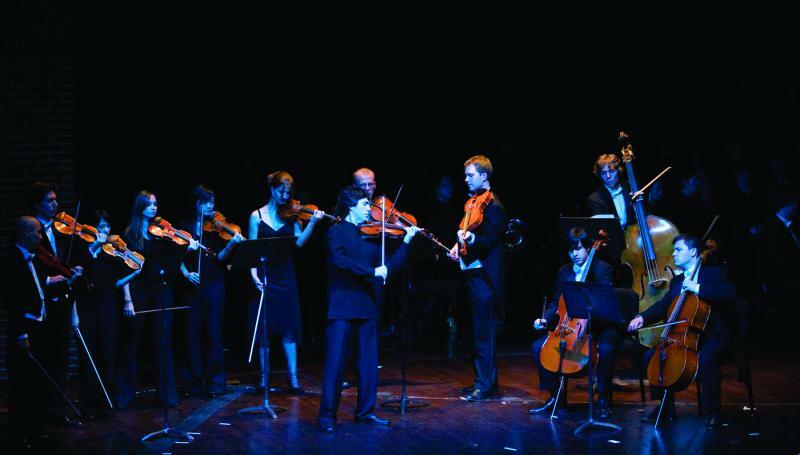 In January 2010, ICS performed at the W.M.P Concert Hall and at the Association of Performing Arts Presenters National Conference in New York City . ICS was an orchestra in residence at the 2010 Southampton Arts Festival in Long Island, NY. 2011-12 Season includes performances in New York City, Los Angeles, Toronto,Washington DC, Danbury CT, Michigan, Kansas and eight concerts Mid-West tour. International Chamber Soloists.All rights reserved.